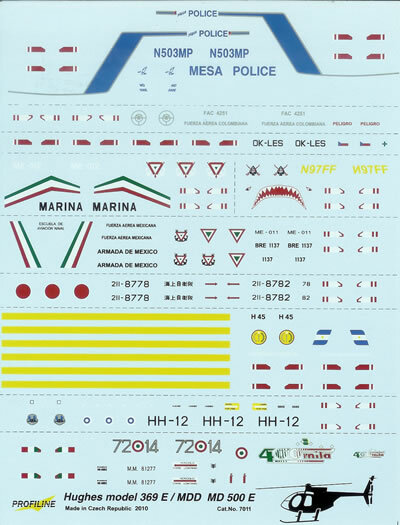 45 x tan and 6 x clear styrene parts, decals for 8 & 9 subjects (500D & 500E respectively), 1 x self-adhesive film for cockpit instrumentation. 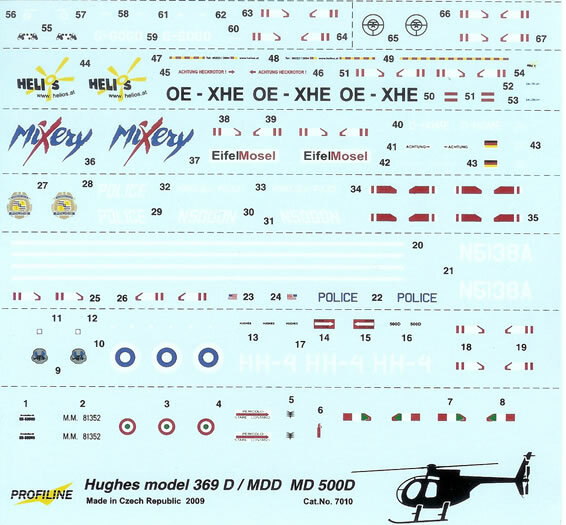 Good quality kits of a significant but overlooked subject, great range of decal choices. Excellent kits of interesting and attractive subjects, although the self-adhesive instrument panel may please everyone. Profiline is a company I only became aware of last year when reviewing their first injected aircraft kit, the Let L-13 Blanik glider. The kit was typical of the better quality limited run Czech kits, and an excellent first release. At the time Profiline advised that their next release would have wider appeal. 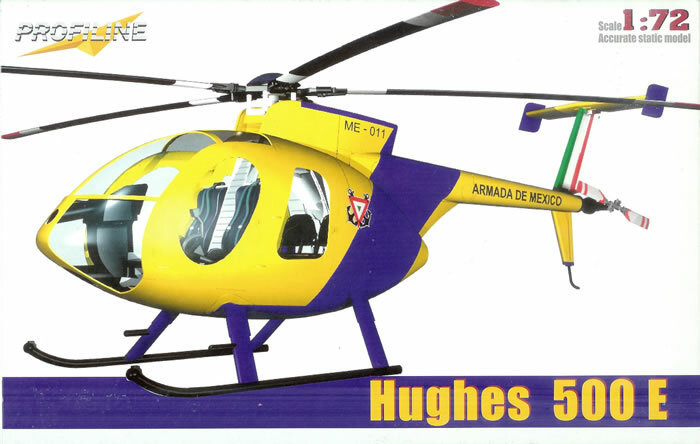 Well it seems they were serious, as they plan to release a number of kits from the Hughes OH-6/500 and MD-500 family of helicopters. 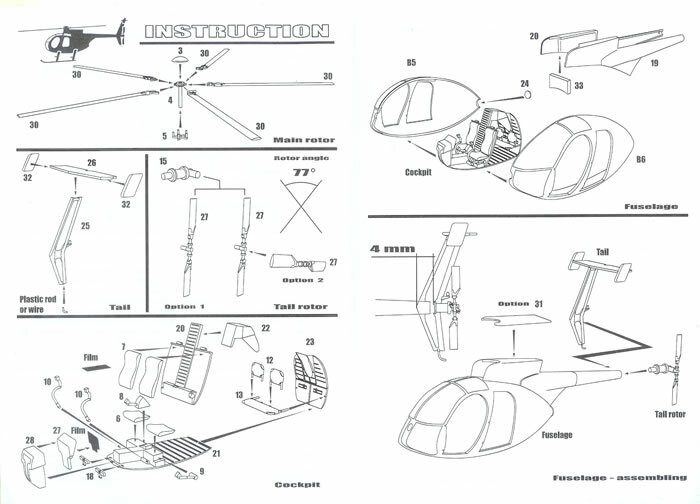 This is quite a step up in terms of subject complexity from a relatively simple glider. The only previous 1/72 OH-6/500 kit I am aware of is the very good Italeri AH-6A offering, so Profiline have not been shy when it come to the competition. It is clear already with the release of the first two kits, a 500D and 500E, that Profile intend to cover more options than Italeri. 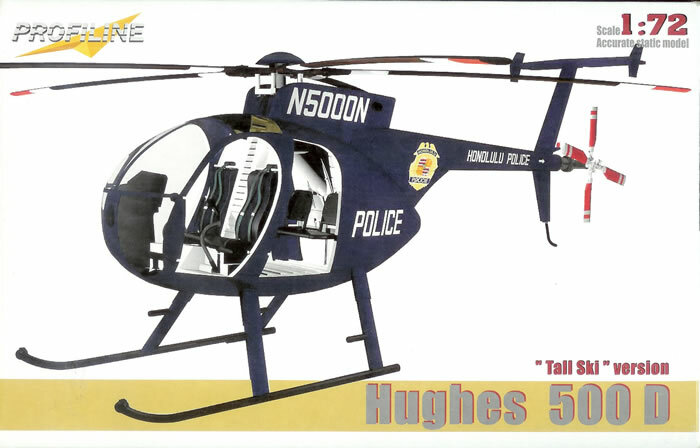 I grew up in a southern New Zealand town where the Hughes 500 was a popular choice for both deer hunting and live deer recovery. So I am very pleased to see a range of civilian versions of this helicopter being offered. Both kits come in typical Czech end-opening boxes with attractive art-work on the front, and an indication of the colour schemes covered on the rear. 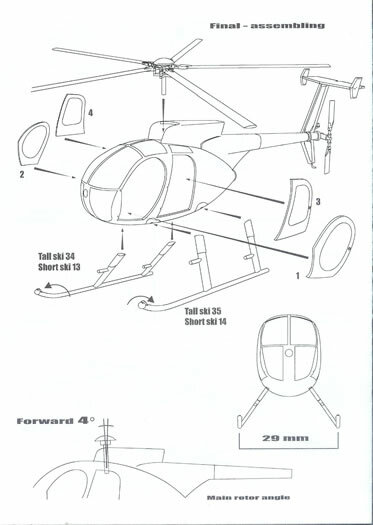 The instructions are simple and uncluttered, with generally very clear assembly diagrams. These are in English and provide additional advice where needed. 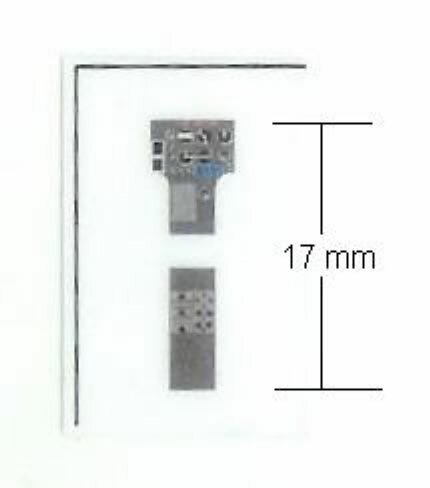 The parts and decals are enclosed in a zip-lock plastic bag. Colour call-outs are generic, and restricted to exterior colours. Where things could get a little confusing with the 500D kit is that the instructions refer to both long and short ski legs, but don’t relate this choice to any of the versions covered. This is probably because the box-art advises that this boxing is for the tall-ski version; the kit has both length legs, but just use the long ones for all the decal choices. In the case of the 500E the applicable choice of legs are advised as short ski against the colour scheme concerned, or otherwise not mentioned, which implies the long should be used. Although not a major issue, I think Profiline should consider being clearer on this point. Both kits share a well-moulded sprue with a nice gloss finish to the tan coloured parts. These are from a metal mould, with fine moulding of detail parts, small sprue gates and parts numbering. There is just the tiniest hint of flash along some edges, but this should be dealt with very easily. Airframe surfaces have very fine recessed panel lines and raised detail where appropriate. Small detail parts are nicely done too. 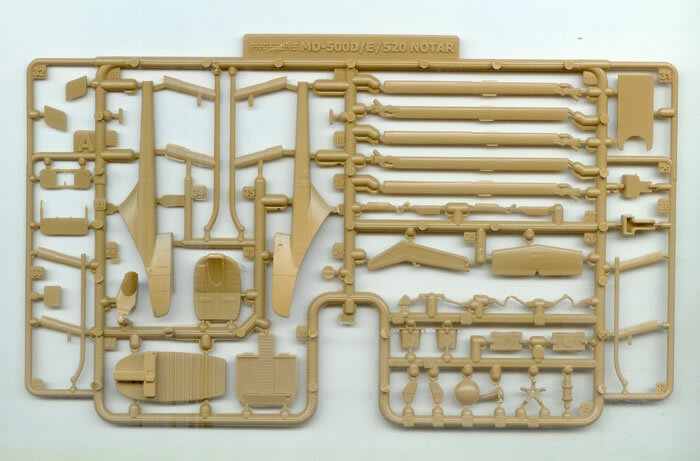 The sprue is labelled “MD500D/E/520 NOTAR”, so at least another variant is due. Both the 500D and pointed nose 500E cabins are moulded in two clear halves with four separate doors. 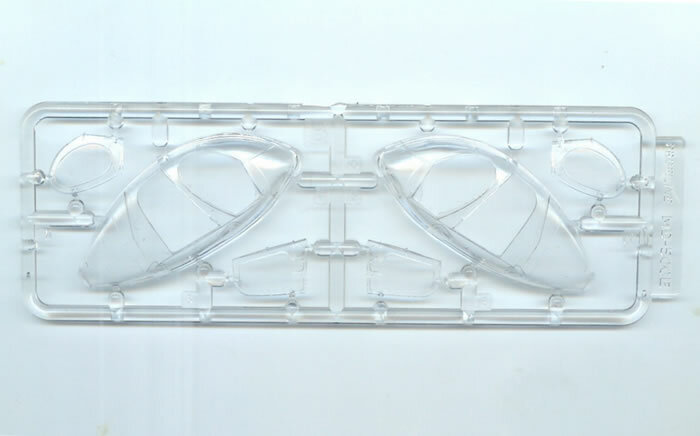 These are moulded to a very high standard, as obviously the mould needs to be as near perfect and smooth as possible for transparencies. I did notice one very slight blemish in the window of one of the doors on the 500D. 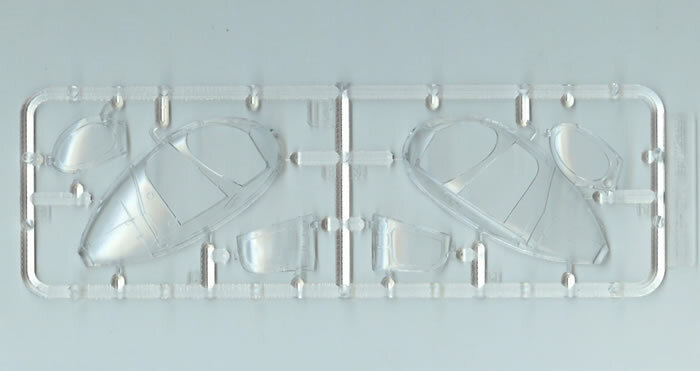 It looks like a flow line in the clear plastic rather than a mould blemish however, and is probably unique to my sample. There is enough interior detail to keep most happy in this scale, but some will want to at least add seatbelts. An interesting aspect of both kits is that self-adhesive films cater for the instrument panel and centre-console, with instruments and switches printed in colour. The modeller will need to cut along the outlines before fixing in place. The rationale behind the films is that representation of all that is on the real consoles is not possible in this scale in styrene, yet they provide more than is possible with a decal. I think that there is some truth in this, as certainly more is shown than would normally be possible with a decal. However I think some modellers would like to have seen an attempt, albeit it compromised in terms of accuracy, at providing a 3-D instrument panel and console as an option. Personally, I’m happy enough with the film provided that the adhesive backing is good for the expected life of the model. 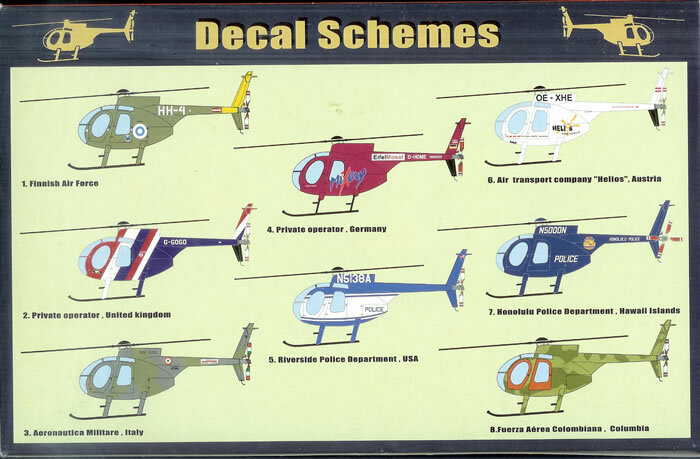 Decals for no less than eight 500D’s and nine 500E’s, in both military and civil service, are offered. Please see the images of the reverse sides of the boxes for a guide as to the variety provided. 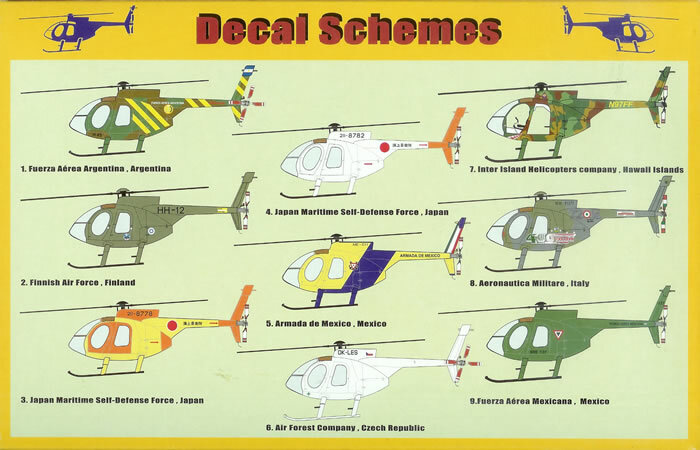 There are some great choices of colour schemes, and these serve to emphasise just how diverse the operators of these helicopters are. The sheets also include full decals for the tail rotor, which is a nice touch to save on some tricky masking and painting. The decals look to be well registered with good colour density. I have no hesitation in recommending either of these kits to helicopter fans, or for that matter, modellers of other subjects who are tempted by the 500’s cute shape and variety of plumage. Well done to Profiline for an excellent choice of subject and high quality execution. I for one will look forward to the MD-520 release. I encourage readers to support this new company as they are showing much promise, and I for one would like to see more of what they can do. Thanks to Profiline for this review sample.